I am so excited that our seasonal veggie share has started. I always rant and rave about it. I can't help it. I just can't say enough good things about it and highly recommend everyone sign up. We get the bi-weekly share and it's more than enough for two people. I always want to get the weekly share, but it wouldn't be realistic to eat it all in time. Anyway, we received some fresh rhubarb, and decided it would be good to make pie, as I had leftover pie dough in the freezer from the pie workshop at Life of Pie. Rhubarb has a soft spot in my heart, as it reminds me of making jam with my grandma. 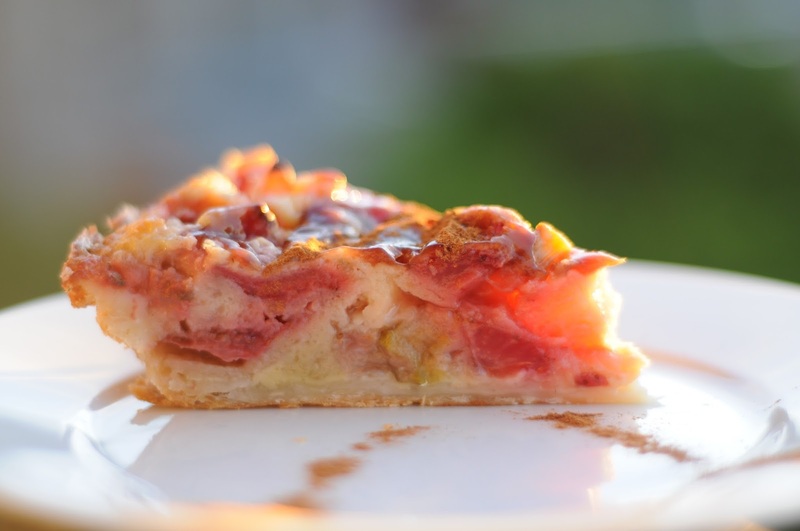 Strawberry rhubarb is a classic combination and I decided to make a rhubarb strawberry custard pie, because it sounded good. I modified a recipe from all recipes to make improvements based on the reviews so I can share a new and improved recipe. I gotta say, I was pretty impressed that I was able to whip this up in no time. I didn't even leave a big mess. Usually by the time I am done cooking I have no energy left to clean, but for some reason I had a burst of energy after work one evening, made the pie, a soup and managed to clean a little bit. Stefan said the pie was excellent. I liked it too, and will definitely make again. It will be sooner rather than later as we got more rhubarb yesterday. mmmm Enjoy! Combine rhubarb and strawberries in a bowl and add cornstarch.Transfer to the pie crust, distributing evenly. Whisk eggs, sugar, milk, vanilla, flour, and nutmeg together in a medium bowl. Slowly pour filling over rhubarb mixture until it just reaches the top edge of the crust. Scatter diced butter evenly over the top of the filling. Lightly tap and shake the baking sheet to remove any air bubbles. Transfer pie to the preheated oven and bake, turning halfway through, until rhubarb is tender and custard is set, about 1 hour. Mix strawberry jam and water in a small bowl; heat in the microwave until warm, about 15 seconds. Glaze the top of the pie with the jam mixture and let cool. Refrigerate until ready to serve.